ULTIMATE SOLUTION TO LIGHTEN MARKS AND BALANCE SEBUM SECRETION - Rejuvenate Skin & Scalp - 100% Pure, Undiluted & Natural Essential Oil - Perfect For All Skin And Hair Types - Free From Chemicals, Synthetic Colour Or Fragrance Benefits - For Blemish Free Skin And Moisturized Healthy Hair! FOR SKIN Geranium Maculatum (Geranium) essential oil is non - greasy with a pale yellow or greenish yellow colour and has a thin consistency. It gives you a flawless skin by lightening scars and marks. It effectively controls acne, protects from fungal infections and deeply cleanses skin. Its rich astringent properties give a firm skin tone, control aging signs like fine lines or wrinkles. Pleasing and uplifting aroma of this oil removes body odor. FOR HAIR Geranium essential oil nourishes your scalp, strengthens hair roots, balances sebum secretion from the scalp and helps your hair look vitalized and healthy FOR DIFFUSION Geranium essential oil’s depth of floral aroma calms mind attuning your Muladhara, The Root Chakra. It also uplifts mood and induces a feeling of relaxation. Physically, it influences the human reproductive system and energy to the legs, knees, and feet. This chakra also influences self - preservation like work, home, family, money, food, and relationships. It affects your sense of danger, judgement of truth, and gut - level recognition. 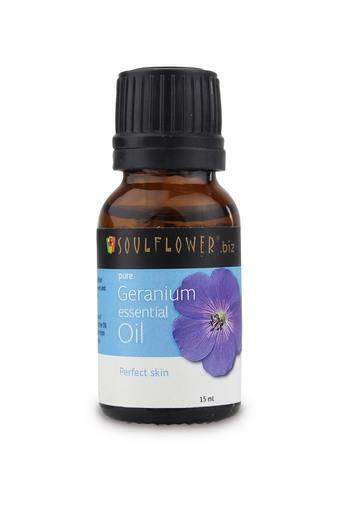 Mix Soulflower Geranium Essential Oil with any Soulflower carrier oil before applying on hair and skin. Massage gently. Add 2 - 3 drops to olive oil for nail care. Diffuse or apply a small amount to your pillow to calm your mind aromatically. Warning - Do not apply directly on hair or skin. How To - BEST EFFECTIVE RECIPES Natural Deodorant Add 5 - 6 drops of Soulflower Geranium Essential Oil to a spray bottle and mix 6 tablespoons of water. This all - natural beneficial deodorant is perfect use all - day long. Homemade conditioner for dry hair Add 10 drops of Soulflower Geranium Essential Oil in 1 cup of water and pour this blend in a spray bottle. Shake the bottle before using and then spray on your hair after washing. Leave it on your hair for 5 minutes and then rinse it with cold - water. Insect Repellent & Bug Bite Healer Add 7 - 8 drops of Soulflower Geranium Essential Oil in 1 cup of water and add a 2 - 3 pinches of baking soda into it to boost its effectiveness. Spray the blend on your body. Diluted Geranium Essential Oil can also be used as a massage oil to soothe itchiness. Keep bottle away from direct sunlight or water contamination. 100% Pure, Natural and Vegan Soulflower Geranium Essential Oil moisturizes your hair without making it greasy, rejuvenates skin and scalp, controls wrinkles, body odor and gives you a blemish free skin.